The altar is often the focus of religious ceremony, and is usually found at the center of a Wiccan rite. It’s essentially a table used for holding all of the ritual tools, and can also be used as a workspace in spell casting. Your magical altar is a place for ritual and spellwork, and can be set up anywhere you have the space. Although many people include traditional tools on the altar, you can use whatever fits your budget and needs. Be sure your altar contains all you need for effective ritual or spell work before you begin your ceremony. An altar is easy to make. If you have a small table that’s not being used for other things, great! Will you be doing a lot of rituals outdoors? Use an old stump or a flat stone. If you’re short on space, such as cramped apartment or dormitory quarters, consider an altar space that can be used for other purposes as well – the top of a dresser, a cedar chest, even a footlocker. Do you live in an environment in which you’d like to keep your altar private? You may wish to just create a “portable altar” that can be put away when not in use. Find a nice box or bag to keep your tools in, and then get them out when you need them. If you have an altar cloth, it can double as a storage bag – just put all your tools in the middle, bundle them up, and tie it shut like a pouch. You can have permanent altars that stay up year round, or seasonal ones that you change as the Wheel of the Year turns. It’s not uncommon to meet someone who has more than one altar in their home. A popular theme is the ancestor altar, which includes photos, ashes or heirlooms from deceased family members. Some people enjoy having a nature altar, on which they place interesting items they find while out and about – a rock, a pretty seashell, a chunk of wood that looks appealing. If you have children, it’s not a bad idea to let them have their own altars in their rooms, which they can decorate and re-arrange to suit their own needs. Your altar is as personal as your spiritual path, so use it to hold the things you value. So you've decided to perform your first ritual, and you're setting up an altar. Great! Now what? It's actually pretty simple to set up a basic altar. You'll probably want to include a few things, like your magical tools, but ultimately the altar should be about functionality. It needs to be set up to help you achieve your goal. 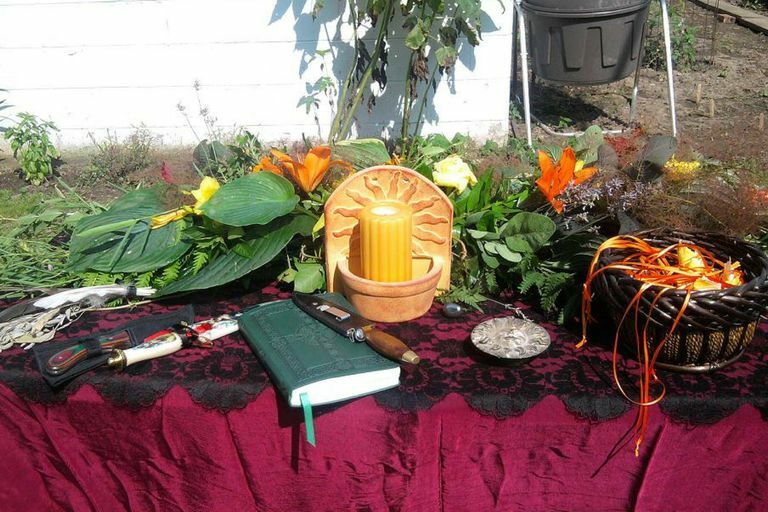 Here are the things that most traditions of Wicca and Paganism include on altars. Symbols of the four classical elements. Typically, these are aligned with the four cardinal directions. Use a bowl of dirt or sand in the north aspect of your altar to represent earth, a stick of incense in the east can symbolize air, a candle or charcoal in the south for fire, and water in the west. Candles. You can add a goddess candle and a god candle if your tradition calls for them, or you can use candles representing the four directions. Be sure to have a lighter or matches handy. The athame. Most Wiccans and Pagans use an athame in ritual, so place one on your altar if you'll need it during a ceremony. The wand. The wand is used to direct energy, so if you use one, keep it on your altar. Your Book of Shadows, or BOS. If you're going to be doing rituals, it's helpful to keep this on hand. Add other items as needed, and as space allows. You can include whatever spell components you need, cakes and ale, and more. If you're celebrating a sabbat, you can decorate your altar for the season as well. Regardless, make sure your altar contains all you need for effective ritual work BEFORE you begin your ceremony. Once you've figured out what you like to have on your altar, and where you want to actually place those items, add a simple sketch or even a photo into your Book of Shadows, so you can easily construct your altar again the next time you need to.